Manufacturer of a wide range of products which include anti aging face pack, lacto tan removal face pack, absolute acne repair face pack, herbal face pack, anti acne face pack and d-tan t-zone mask. Concern: D-Tan T-Zone Mask helps treat the most common problem area of the face called T-Zone. • Milk Protein, Rosmarinus Officinalis (Rosemary) Extract, Camellia Sinensis (White Tea) Extract, Alpha Acetyl Tetrapeptide-5, Punica Granatum (Pomegranate) Seed Extract, Curcuma Longa (Turmeric) Root Powder, Glycyrrhiza Glabra (Licorice) Root Extract, Daucus Carota Sativa (Carrot) Seed Oil, Vitamin C, Olea Europaea (Olive) Oil. • Activated Charcoal, Bambusa Vulgaris (Bamboo) Extract, Malachite Extract, Lepidium Sativum (Swiss) Sprout Extract, Hieracium Pilosella (Hawkweed) Extract, Albizia Julibrissin Bark (Silk Tree) Extract, Gaultheria Procubems Leaf (Dhasingre Oil) Oil, Aloe Barbadensis (Aloevera) Extract, Olea Europaea(Olive) Oil. Activated Charcoal Powder, Witch Hazel Extract, Tea Tree Extracts, Olive Oil, Rosemary Oil, Calendula Extracts, Base Q.S. Apply a thick and even layer of the masque on the Face (avoid eyebrow, eyes and lips). Leave it to work till completely dry and then peel off. Rinse face with warm water to remove any excess left over. Be O Man Activated Charcoal Face Pack will naturally detoxify your skin and give you three times Skin Lightening & Whitening. Your wrinkles and fine lines will be reduced and your skin will regain its youthful complexion. Activated Charcaol Powder, Kaolin, Clay, Camellia Sinensis Leaf, Argania Spinosa Shell Powder, Argan Oil, Shea Butter, Aloe vera Leaf Juice Powder, Menthol, Tea Tree Leaf Oil, Eucalyptus Oil. Apply a fine layer on the skin avoiding the eyes. When the pack dries, wash off gently for soft, glowing skin. 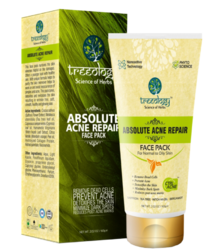 Being a leader in this industry, we are devoted towards providing a premium quality array of Acne Repair Face Pack. This black, mineral-rich mask offers an exceptional peel-off result that provides powerful detoxifying, purifying, and brightening results. Made with premium quality clay, its deep-cleansing characteristic removes dirt and oil. With natural ingredients works to exfoliate skin and refining pores. Powerful antioxidants minimize pores, repair skin, and reduce irritation. Once dried, the mask removes dead skin, impurities and excess oil to reveal instant and noticeable results. •Skin looks smoother and clearer and pores appear smaller. •Molecular film design to optimized delivery of Glycolic acid &offers superficial peeling. We are offering Acne Repair Face Pack.